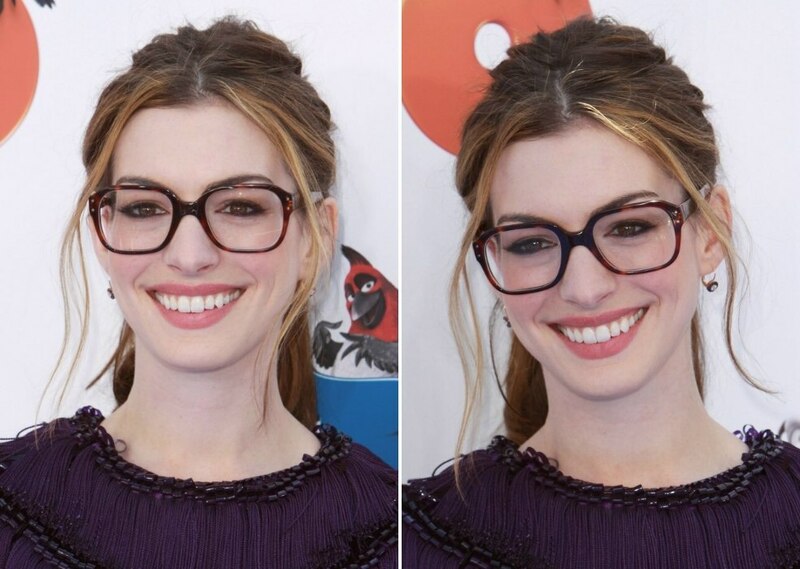 Anne Hathaway ditched her eye contacts and wore her super large glasses when she attended the Los Angeles Premiere of "Rio" on April 10, 2011 and she looked absolutely smashing! Her large glasses gave the perfect attractive frame for her gorgeous brown eyes. Anne wore her long reddish brown hair with the short part in the center with her blonde tendrils hanging along the sides and with a loose brush her hair was brought back to be secured in the back to establish a thick ponytail. Her hair was an easy hairdo and looked to have a stroke of formality for the event. Her petite earrings presented a conservative and modest appeal that went very well with the high rounded neckline of her dressy purple dress. Anne's makeup was richly blended in fair tones with a light pink touch to her cheeks. She is wearing encircled eyeliner and mascara on her lashes. Her eyebrows are tweezed neatly in a medium/thin shape and darkened to bring out the drama of her eyes. Her lips are given a coral rose tone that snaps everything together.